Ed Mayo on the big ‘bet’ we cannot afford to lose. Ending the Global Casino? 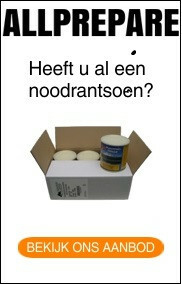 By Ad Broere. My first and only foray into gambling was an afternoon with my 12-year-old brother at the horse races in Fakenham in rural Norfolk. I bet my pennies on every other race, watching in awe, pint-sized by the rails on a final corner, as the thrill of sweat and noise, crowd and cheers washed towards me, broke and then waved on to the final line. My pocket money all went to the bookies, but I learned something from my big brother, who ended ahead. He stood innocently around the punters in conversation close to the gate and got his tips from close to the horse’s mouth: Don’t bet on the name of the horse – find out what’s really going on. Until this review book arrived from Resurgence, I’d assumed that I had never in fact set foot in a casino. 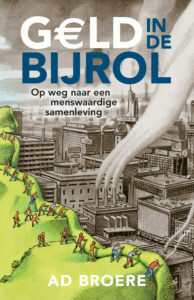 The author, Ad Broere, set me straight. Our home streets may be named as in Manchester, Dartington or Manila, but the reality is that we all live in a global casino. We are all the gamblers. We gamble every day and yet we fail to see it. 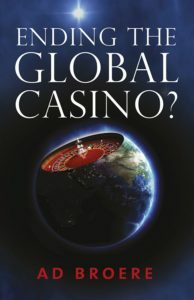 Ending the Global Casino? is a book written with passion. It is a polemic, but a polemic with cartoons. There is a tradition of social critics, including Noam Chomsky and more recently Naomi Klein, in which the only light moments in pages of forensic analysis are passages of ironic comment that make you smile and wince at the same time. Broere is a more lovable radical, combining anecdote and insight with a touch light enough to believe the seriousness of his underlying message. In the global casino, he shows financial-market traders who buy and sell during the day and take cocaine at night. Both give a thrill. Both allow them to act without any sense of proportion. With both, they can’t stop where they know they really should. In the global casino, you can win without ever making a full gamble. A sleight of the hand in modern capitalism is that there is often no capital behind it. Fractional reserve banking creates money, well beyond your reserves, from thin air. Rules drawn up by the bank that financed the Nazi war machine in the 1930s and 1940s (the Bank for International Settlements) then allowed banks essentially to create reserves from thin air. In the global casino, you keep playing because you can’t see when you lose. 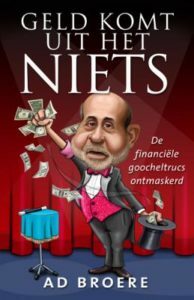 Following the work of Margrit Kennedy – the great citation for all recent monetary reformers – the author explains how 40% of the cost of everyday goods and services actually goes to pay off the interest that is due in a system where money creates money. There are points of light that the author draws our attention to. There is the heroic work of the no-interest Swedish cooperative bank JAK. And the Swiss WIR is one of the complementary currencies that offers hope of reintroducing diversity in economic life – the right mix, as he sees it, of connectivity and resilience. So what is his advice for casino dwellers and one-time horse-racing gamblers? It’s simple – “Give up your addictionâ€ – but somewhat harder to enact. There can be revolutions in economy, society, technology and politics, but only evolutions in thinking. Even changes in paradigms, as Thomas Kuhn saw it, displace thinking over generations as the old views die out. It is only great works of art and great canons of dissent that reach across both, to tempt the old and give strength to the new. Broere argues that we do not have the time to wait. He predicts that we are in the foothills of an economic cataclysm. He sees this as sweeping away existing savings, investments, jobs and hopes, to be replaced by a single world currency, imposed in crisis and controlled by the few. In the face of that bleak prospect, he offers cooperation and a new relationship between planet, people and capital. These are the biggest stakes of all. We may have no choice, but it is not a bet that we would want to make, let alone lose.